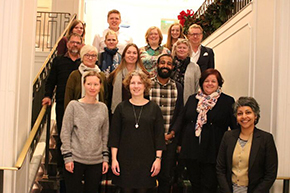 Danish child welfare experts and researchers with an interest in the use of predictive risk modelling (PRM), travelled to Pittsburgh and Los Angeles in November to join an intensive study tour led by CSDA Co-Director Rhema Vaithianathan. The group included Denmark’s foremost social investment expert Michael Rosholm (TrygFondens Center for Child Research, University of Aarhus), researchers from VIA University College and regional child welfare leaders, who wanted to learn more about how to implement predictive risk models for child welfare. The visitors spent two days each in Pittsburgh, PA and Los Angeles, CA. The Pittsburgh sessions focused on the Allegheny Family Screening Tool, a predictive risk modelling tool that helps call screeners make decisions about child maltreatment allegations. In Pittsburgh the visitors heard from Marc Cherna (Director, Department of Human Services), Erin Dalton (Deputy-Director, DHS), Alexandra Chouldechova (Statistics and Public Policy Researcher, Carnegie Mellon University) and Dr Rachel Berger (Division Chief of Child Advocacy Center, Pittsburgh Children’s Hospital). In Los Angeles the group learnt about work towards potentially implementing PRM in a very different setting, LA County, including a session with CSDA Research affiliate Emily Putnam-Hornstein (University of Southern California). Dan Makelky (Director, Douglas County DHS) also shared his experience of collaborating with CSDA to develop a prototype Child Welfare PRM for Douglas County. The researchers leading the independent impact evaluation of the Allegheny Family Screening Tool, Jeremy Goldhaber-Fiebert (Stanford University), briefed the visiting group about evaluation and shared preliminary results. Rhema Vaithianathan said the study tour was needed because there is a ‘world of difference’ between developing a theoretical PRM and getting to the point of implementing a tool that has a chance of addressing entrenched problems like child maltreatment. “After spending intensive time with researchers, data scientists, agency leaders and technical experts and hearing about several very different applications of PRM, our visitors left the US with a much stronger understanding of what it takes to bring a PRM project to life”.